What is another word for contradict? 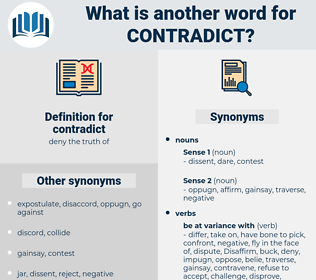 contravene, Contravened, refute, violate, rebut, disprove, counter, countering, negate, disagree, infringe, oppose, overrule, reject, breach, breaches, undermine, interfere, invalidate, differ, object, dispute, offend, thwart, resist, challenge, frustrate, defeat. 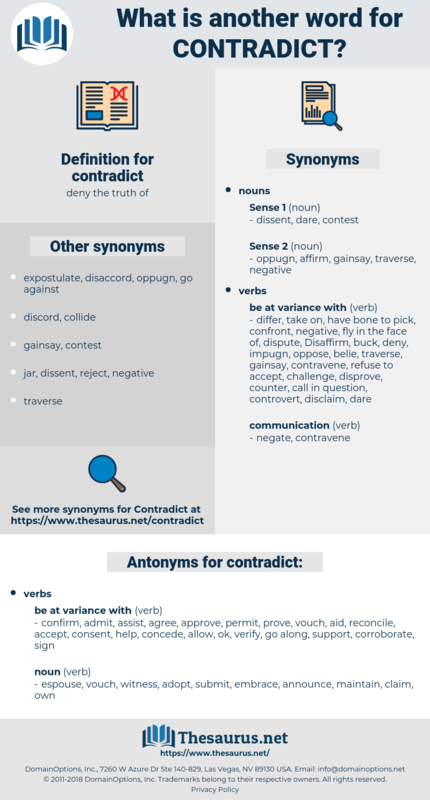 confirm, admit, assist, agree, approve, permit, prove, vouch, aid, reconcile, accept, consent, help, concede, allow, ok, verify, go along, support, corroborate, sign. adopt, submit, witness, espouse, own, embrace, claim, announce, maintain. The Hapsburgs have not power to contradict it more. Whatever I may say, don't contradict me. disagree, differ, take issue, dissent.